The Global Venture Labs Investment Competition simulates the real-world process of raising venture capital. It is a unique partnership that brings together graduate students and business leaders. The judges function as an investment group seeking to reach consensus on the business venture they would most likely fund. The quality of the idea, the strength of the management team, the clarity and persuasiveness of the written plan, and oral presentation all influence the judges’ decisions. 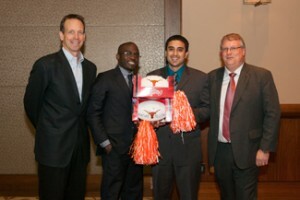 Begun as “Moot Corp” at The University of Texas at Austin by MBA students in 1984, the Venture Labs Investment Competition is the oldest new venture competition in the world, and it provides graduate students with a chance to simulate the real-world process of raising venture capital. Global Venture Labs first runners-up and Texas MSTC team, Beyonic. The 2013 competition was sponsored by Jon Brumley Texas Venture Labs, an interdisciplinary education and research initiative. The Texas Venture Labs promotes new venture creation at The University of Texas at Austin through education and mentoring, market and business plan validation, team-building and networking, and direct links to resources and funding. The first runners-up of this year’s competition were Dan Kleinbaum and Luke Kyohere, graduate students from the Texas Master of Science in Technology Commercialization program whose startup, Beyonic Technologies, has developed a mobile payment platform for use in the developing world. 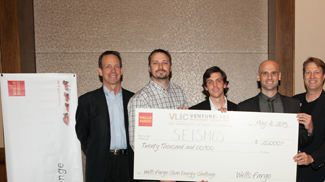 Seismos also won first place in February’s Texas Venture Labs Investment Competition, as well as first-place awards in clean energy and cleantech tracks in the Shell Venture Technologies track at the Rice Business Plan Competition at Rice University in Houston. They continued their winning streak by picking up the clean-tech and energy awards, as well as an overall second-place award, at the University of California Haas School of Business investment competition in Berkeley. This year’s GVLIC had an especially strong international presence. Eleven countries were represented, and 40 percent of the competing teams came from schools outside the United States.